May 5th is just the summer festival. On that day, Guangbo held "greeting the summer and fighting the eggs" interesting activities. Over 50 employees from each branch company and sub plant attended this game. The game has not started yet, and the scene was busy. “Before playing eggs, we compare our eggs to see which one is the most beautiful.” Under the proposal of a few contestants, all of them showed their own "fight eggs". There was a "little yellow man", with Guangbo logo printed, "crayon small new" pattern, and "free coloured drawing". All kinds of "fighting eggs" attracted people's attention, and they also activated the atmosphere. The game adopted the elimination system. The winner was determined by a group of four people. Then two fighted with two, until someone took the championship. As the game began, everyone has entered the state, using all means. Some using strength smartly, some with brute force, they constantly adjusted their posture to deal with different players. Although the game was fierce, the atmosphere was not tense. Qualified players were talking and laughing on the stage, exchanging experience in selecting eggs and "leaning on eggs". The contestants who did not win peeled their eggshells under the platform, leisurely eating the eggs that have already been defeated, enjoying the game on the stage. After fierce competition, Xia Yawei of the global Tao company finally won the championship with her goose egg, and won the title of "the king of eggs" in Guangbo. A heavyweight athlete also appeared on the scene. 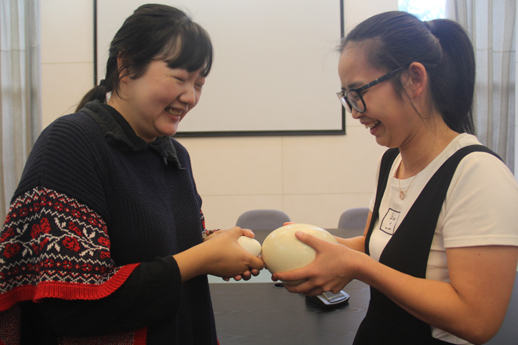 Yang Huanyu, from the technology department, took part in the competition with a "huge body" ostrich egg. Considering the strength of the ostrich egg, the jury decided to give it the best Participation Award directly. The activity fell to the curtain in a laugh. The contestants got full automatic rice cookers, imported filter bottles, fashion bags and other prizes. For a long time, Guangbo has paid great attention to the amateur life of employees. All kinds of interesting activities come out in an endless stream. Next, the company will also organize more rich and varied activities for its employees.